Hayate lets Nagi and Maria know about the need to get the key to unlock the case that holds Mikado’s will so Nagi can inherit the Sanzenin legacy. Since Mikado told Hayate they have to find the key, Maria marvels that he lost it, causing Mikado to burst in and declare he didn’t lose it. He has with him a small chest that had contained the key, which by tradition, the current holder of the inheritance would hide for the heir to find. Mikado states that he recently opened the box and discovered a terrible secret. He opens the chest and inside is a note from Yukariko, declaring she took the key. Maria scolds Mikado for losing the key as Nagi and Mikado pinch each other in frustration. Maria wants to know why a locksmith couldn’t be summoned to open case and replace the lock. Mikado reveals that should anyone attempt to force the lock, they will die. This news results in Mikado getting more scoldings. Maria and Nagi are over this and start to leave as Hayate asks if Yukariko left a clue. Mikado has a hard time believing his daughter would take the key for no reason, but Nagi says that is exactly who her mother was. Maria suggests they look at this like a child’s game, which Hayate likes, feeling Yukariko would want everyone to play and would thus leave a clue. Nagi decides they will play this child’s game. Hayate recaps in his mind what he knows about Nagi’s mother, including his meeting Yukariko in a dream when she summoned him. Meanwhile, Nagi says they should visit Isumi’s mother (Hatsuho) and Wataru’s mother (Mikoto) to get more information about Nagi’s mother. They will start with Hatsuho. The way the manga has gone of late, this is how it should have been going all along (for the most part) — move the plot forward, but include a side of gag humor. That’s how Hayate the Combat Butler chapter 525 worked. I’m really hoping that we are about to get a lot of information about Yukariko. We have only tiny bits of information on her, usually showing her goofy side (which is a main personality trait), but also that she loved Nagi greatly. However, I want to know more about the man Yukariko married. I want to know more about Yukariko taking the Royal Power. I want to know why she died and what happened to her husband. By visiting Hatsuho and eventually Mikoto, we should be able to get nice flashback episodes that flesh out Yukariko a great deal. That’s what I want to see. I got a kick out of Mikado’s desperate denials of having lost the key and how Nagi and Maria scolded him repeatedly. This ended up being the source of the gags for the chapter and that worked pretty well in combination with the plot being pushed forward. Anyway, while I’m sure there will be plenty of gags coming from MC Hatsuho next chapter, I’m looking forward to seeing what she has to say about her Yukariko-neesama. As to this chapter, it was a good blend of plot and gag humor. I really don’t care about Yukariko or the King’s Jewels plot, personally. I believe that at the core of the series (as it’s always been) is the misunderstanding bomb between Hayate and Nagi and really, everything that’s been going on so far are just supplementary elements that help to flesh out what I believe will be the climax or near the climax of this series — the unraveling of the misunderstanding completely and what happens afterwards. The Sanzenin Inheritance is the main plot of the manga, IMO. 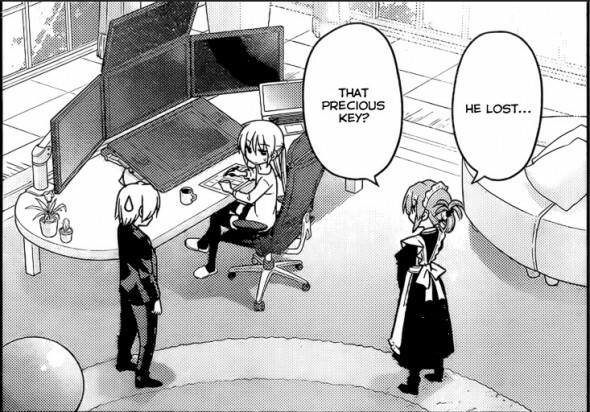 That became clear to me during Hayate’s flashback arc of his time with Athena. The misunderstanding stuff was just a vehicle to get the manga going, and to have some humor. It now appears it could be used to resolve the main plot. On that point, I’ll have to respectfully disagree… and yet, say the same thing as you except vice versa. The relationship between Hayate and Nagi has always been the main plot of the manga for me. The Sanzenin Inheritance and all the arcs we’ve had so far in-between are just complementary. The Sanzenin Inheritance IS the arc that’s overarching over every other arc, but at it’s core, it’s still just a supplement to the character-centric nature of the manga. We can strip this manga down to its basic story elements and the Sanzenin inheritance wouldn’t be necessary. As evidence, I’d present the beta manga AKA chapter 0. It is that chapter that makes me think Hata-sensei will make a Nagi x Hayate ending. However, Hata-sensei made some changes to the manga from that non-canon prototype chapter and the canon first chapter. We can strip this manga down to its basic story elements and the Sanzenin inheritance wouldn’t be necessary. I won’t disagree that it would be a big loss to get rid of the Sanzenin Inheritance plot. The golden week arc was also one of my favorite parts, but probably for much different reasons than you. It’s not just the first chapter. Each arc has actually served to establish certain elements that only serve to convince me more of a Hayate x Nagi ending. Take this with a grain of salt. I am a very biased shipper. 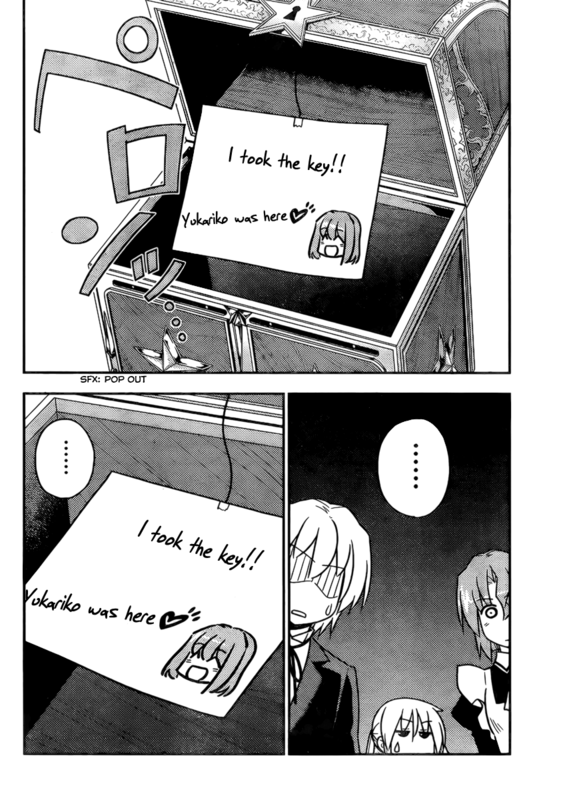 Shimoda Arc – re-establishes the bond between Hayate and Nagi and rules out the “they’re blood related” argument. Also begins Nagi’s slow character development. Golden Week Arc – pretty straightforward for me. Past (Athena) and Present/Future (Nagi). A promise broken in the past. A different promise kept in the present. Also strongly establishes Nagi’s character as the real co-main heroine. Mangaka Arc – Establishes that Hayate is not satisfied with being a butler in debt and that Nagi is not satisfied with the status quo as well. We also see that Maria becomes slightly insecure at the thought of Nagi not needing her (a nod to Nagi’s development). slowly establishes just how broken Hayate is as an individual and how desperate he has some twisted notions of what “love” is all about. 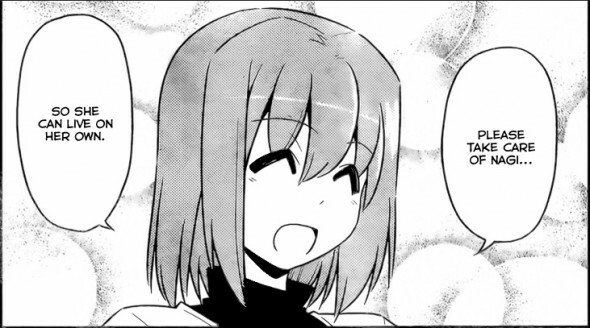 Also strongly pushes Nagi’s drive towards becoming a more mature character and allows her to accomplish something with her own two hands for once without Hayate’s help — albeit this was with lots of help from the people around her — including Ruka. The ending of this arc also reaffirms Nagi’s strong feelings for Hayate and hints at how Hayate might feel about Nagi. Also within the mangaka arc. Wataru echoes Hayate and Athena’s shared confession by using the same words to confess to Isumi. At this point, he also echoes part of Hayate’s words by declaring that what matters is the future he builds with Saki. Heaven is a Place on Earth – re-establishes the bond between Hayate and Nagi. This time, we come to understand that Hayate’s mistress can’t be just anyone. It MUST be Nagi. Not even someone whom he has a crush on like Maria can replace Nagi in his life. Beach Arc/Ikusa and Mini-arc towards recovering Nagi’s inheritance- Shows us a more reliable side of Nagi and also ties up loose ends with Hayate and his brother. Also partly reminds us that the debt will be cleared. Level 5 Arc – Brings to light the “bomb between them” and Hayate’s conception that “there is no love between them (which is wrong because Nagi loves him one-sided as it might appear for now. )” Finally gets rid of Hayate’s debt for good. Establishes Nagi’s feelings of love for Hayate and also shows us how powerful she can be as a character when she uses her head and acts with her newfound maturity. Current Arc/Final Arc – So far, we’ve had an inadvertent confession by Nagi with several nods from Hayate and Maria as to Nagi’s maturity and on Hayate’s side, we’re shown that he values securing Nagi’s future through her inheritance more than his own life — and that he doesn’t seem to be reflecting on Nagi’s confession at all — he will have to eventually, though. If we end this with “I never ever had feelings for her” and then they just leave part ways with a smile, that would be a big waste of all the plot developments so far. It is also strongly implied that Nagi’s heart will be broken eventually — but that’s a good development for me as a Nagi x Hayate shipper. Well, I agree with you in that I think Nagi’s heart being broken has been foretold since the early days of the rules for the Inheritance when it was about making Nagi cry. It was revealed in her profile that she did not die due to natural cause, and seeing as she has been responsible for some major events in the story so far; I will not be surprised if her cause of death will be like a big exposition and explain a lot of things. I am also anxious to know what she wished with the power. She might be goofy and appear as good for nothing but I always got the feeling there was more to her nonchalant nature. She was aware she will not be with Nagi forever so maybe that is why she tried to be lively and cheerful to give her daughter nice memories of her. I don’t know why I always wanted to believe that there is little depth in her character due to the way Hatsuho and Hayate remember her in flashbacks. It will be hilarious if I am proven wrong though coz even Nagi says her mum does things for no good reason. She might be goofy and appear as good for nothing but I always got the feeling there was more to her nonchalant nature. It will be hilarious if I am proven wrong though coz even Nagi says her mum does things for no good reason. Well, what Nagi says is true as well. However, that doesn’t mean there’s not more to her.